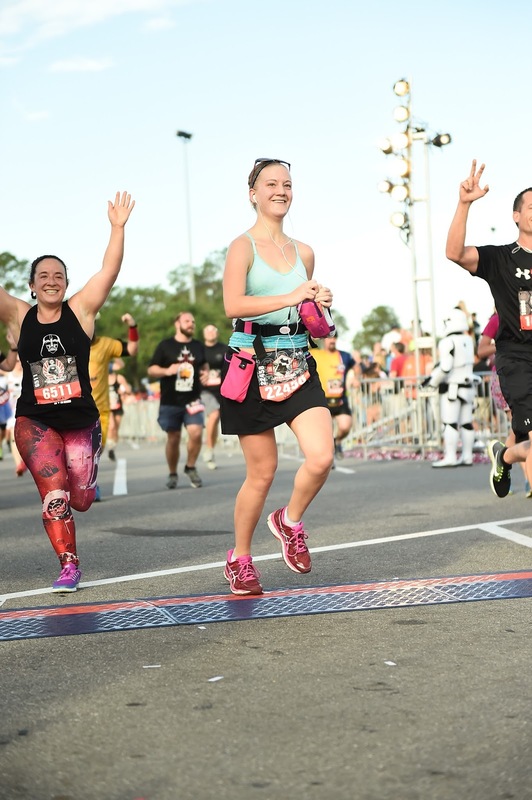 Well, I'm happy to announce that I have successfully completed the 2017 Star Wars Dark Side Half Marathon! The course was fast, fun, and much nicer than last year. Despite having several different issues during training I was able to pull off a time of 2:50:17 which is significantly slower than my PR time but is my fastest time since I moved to Florida. 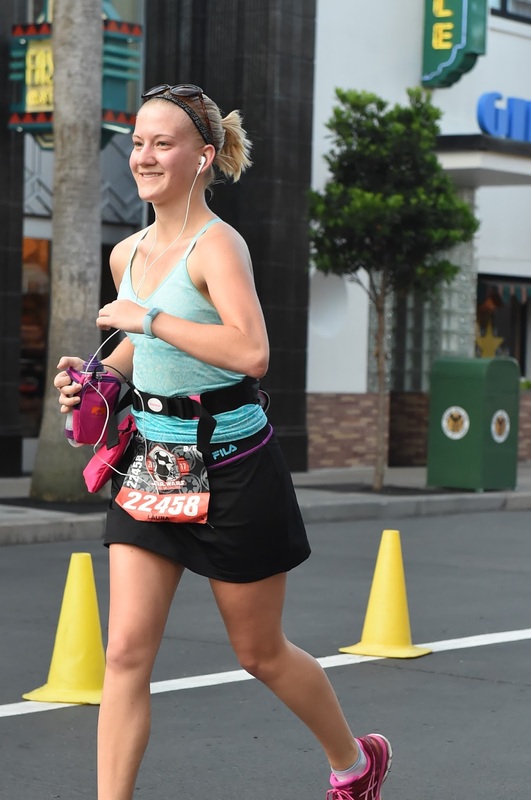 I can't say I'm 100% happy or satisfied with my time because I know I can do better, but it's a start and a good sign that I can do this whole Florida running thing. Like all runDisney races this one required me to get up at dark o'thirty and to the start line extremely early. I got to Epcot at 4:00 and was on the bus to Magic Kingdom by 4:15, which got me to the starting area around 4:45. While I was walking to the corrals I ended up in a pack of people that were literally stopped before corral G, which was an issue seeing as I was in corral D. I was in this crowd for a good 5 minutes before ducking out of it and walking in front of the port o'potty lines which were right in front of the corral entrances. I thankfully was able to get to my corral in time but that crush of people was insane. For next year I would like to see the port o'potties moved a bit away from the corrals as I think those lines were contributing to the back ups. I was happy to see that Disney really cycled the corrals out onto the course extremely fast. It seemed like such a short time passed between the wheelchair start and when I started. I believe the new "wave" system was helping with this, but I don't honestly know how they were splitting the waves. For both the 10k and half I was in the first wave and did not see how the corrals were being split. 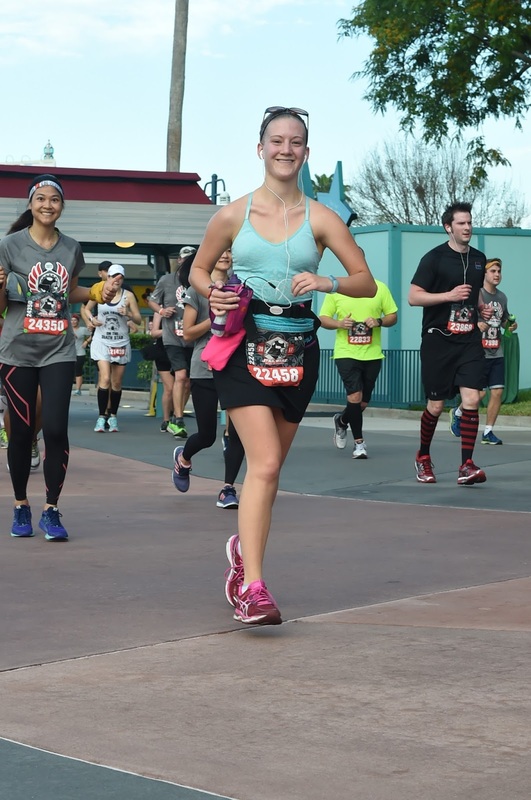 Mile 1 consisted of exiting the Magic Kingdom parking area and went by fairly quickly. I ran the entire mile so that I didn't get caught in the pack and disrupt anyone. According to my fitbit I did the first mile in 11:45, which seems accurate. You could tell that it was extremely humid out and that the end of the course was going to be extremely hot. Miles 2 through 4 were on the roadways from Magic Kingdom to Animal Kingdom (mostly Bear Island). Other than the "fight scene" on Bear Island there wasn't really anything remarkable about this chunk of the course. It was flat, fast, and peaceful. I spent this chunk going away to my "happy place" and laughing every time I saw one of the portable lights. A friend of mine works for the company that provides them and he had told me I owe him for making sure they were set up correctly. According to my fitbit I did miles 2 through 4 in 13:04, 12:26, and 13:17. Miles 5 and 6 were my best miles of the race both time and focus wise. Just before mile 5 I spotted a 2:30 pace group and "latched" onto them. They were doing a run/walk that seemed similar to what I was attempting to pull off. They were an extremely friendly group and I got the chance to speak with a few of them while we ran. I appreciate them "pulling" me through these miles. Miles 5 and 6 took place inside Animal Kingdom and, much to my surprise, were not as humid as last year had been. I enjoyed this section which is a first as I usually hate being in Animal Kingdom when it's hot outside. My times for miles 5 and 6 were 11:04 and 11:07 respectively. It was during miles 7 through 10 that I effectively fell apart physically and mentally. I was hot, sweaty, tired, and my injured foot was acting up. I stuck with the pace group for most of 7 but once we passed that mile marker I gave up and focused on just moving forward at a pace that was comfortable for me. Miles 7 and 8 took place on the section of the course that I mentally broke last year and I started focusing on how hard that had been. The only positive that I took away from this section was that I didn't give up. 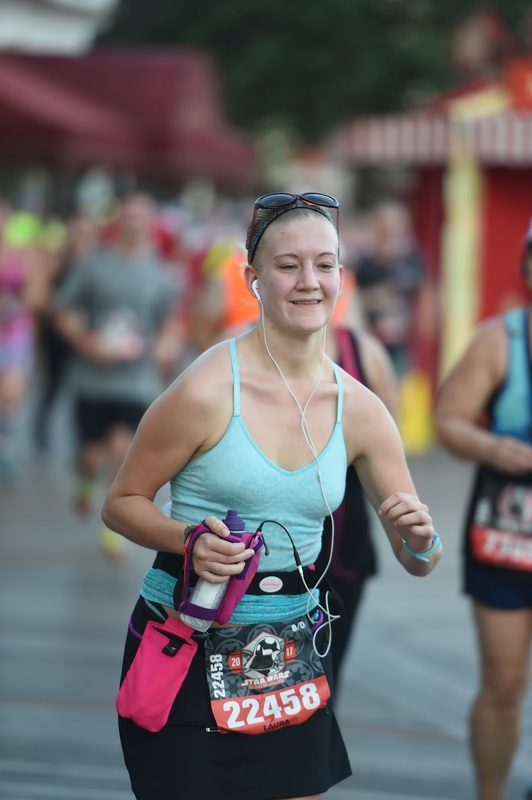 I focused on finding people running at my pace and sticking with them for as long as I could. I did spend a good chunk of time walking because I didn't want to injure myself any further. My times for miles 7 through 10 were 11:39, 13:35, 13:14, and 13:44. Thankfully my race turned itself around after we entered Hollywood Studios around mile 11. I can't say that my times improved greatly but my mental game got better and I was able to pull myself together. This section of the course was almost identical to the 10k and I was able to latch onto the idea that "I did it, I'm almost done". Studios was filled with photopass which is always fun to try and make sure you get caught in their camera and look somewhat decent. From Studios the course takes the river walk to the Boardwalk. Like in the 10k the river walk was congested so I focused on staying out of the way of those faster than me and moving forward. I personally love whenever a race utilizes the Boardwalk because it feels like a "home" to me. Having worked at the Boardwalk I love seeing it all lit up and the memories associated with it. My time for mile 11 was 12:38. After the Boardwalk it was almost like a "home free" moment. You dash up the hill (or walk if you're broken like I was), then dash through the World Showcase, by the "ball", to the finish line just outside the park. I always love this section of races. 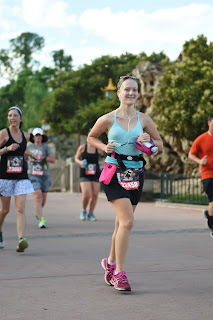 The World Showcase is one of my favorite places at Disney and I love running through it. While running by the America pavilion I saw the 2:45 pace group and joined them for the end of my race. The girls leading this pace group were so energetic and seemed like fun leaders. I honestly wish I had joined them from the beginning of the race. From there my race was over. 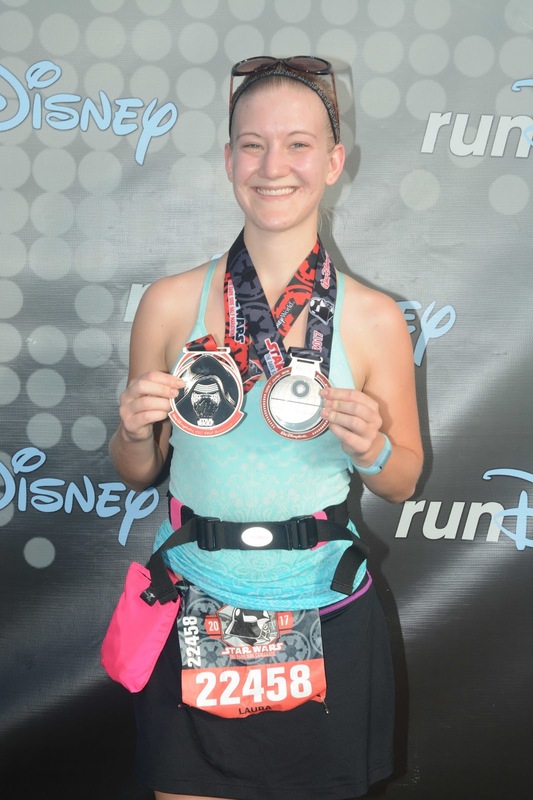 I crossed the finish line at a run and immediately grabbed my medal, cooling towel (finally! ), and the post race snacks. This race was certainly not good for me time wise. 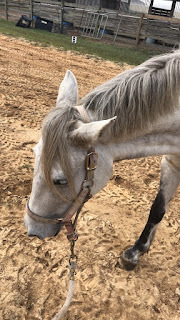 I am embarrassed by my time because I know I can do better and that I have consistently screwed up my training since I moved to Florida. At this point in my running journey I can honestly say that I need help. Training by myself does not work and is doing me more harm than good. Yes, I am finishing my races but my times are nowhere near what I'm capable of. I'm honestly afraid of doing a 5k because I know it will be over 30 minutes which after running sub-30 is humiliating for me. I've been speaking with a friend who wants to get into races and we've agreed to find a running group together. Hopefully, this will help with my confidence, mental game, and times. As a note, this is my only runDisney race of the year. Last year doing 3 was great but financially stressful. 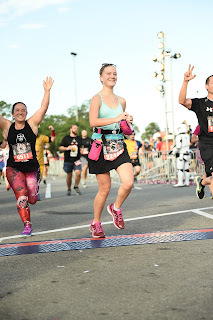 I'm hoping to check out some local Florida races this fall that will not only be cheaper, but allow me to meet more of the running community here.